We have a new name! The MiLW Blog. And you’re still going to get the same great blogging. You’ve probably noticed that we haven’t added any new posts here recently. We are no longer updating The Michigan Lawyer. Here’s why: We have moved The Michigan Lawyer blog from the WordPress domain to our own and renamed ourselves The MiLW Blog. All of the posts from The Michigan Lawyer have been migrated to The MiLW Blog. The bottom line: a new, name, a new domain and the same great stuff from Michigan Lawyers Weekly. Please visit The MiLW Blog and take a moment to update your bookmarks. Harbor Springs attorney James Erhart has been appointed to the 90th District Court covering Emmet and Charlevoix counties. The appointment fills the vacancy created when Judge Richard May resigned. Erhart’s appointment is through Jan. 1, 2015. He must seek election in November 2014 to serve a full six-year term. Erhart, admitted to the State Bar of Michigan in 1979, has practiced law in the Petoskey area for many years. He was a partner and shareholder with the Stroup, Erhart & Lyons law firm. A former adjunct professor in the paralegal program at North Central Michigan College from 2000-2009, Erhart is a state bar commissioner and and chairs the bar’s Upper Michigan Legal Institute. Erhart received his J.D. from the Detroit College of Law. Secretary of State Ruth Johnson has decided to remove the controversial citizenship verification checkbox from ballot applications for next month’s election. [The Detroit News]. The state’s chief elections officer appeared in U.S. District Court in Detroit in a hearing over whether check-off boxes that ask state voters to confirm their U.S. citizenship status on ballot applications should be allowed in November. The ACLU of Michigan, SEIU, the Ingham County clerk and others claim Johnson’s citizenship question caused widespread voter confusion in the August primary after Gov. Rick Snyder vetoed legislation in July that would have made inclusion of the question state law. After the voting rights coalition sued Johnson on Sept. 17 over unequal enforcement of the citizenship question in the August primary, Johnson’s office issued a “News You Can Use” memo to election clerks across the state on Sept. 25 ordering the removal of the question from forms for the presidential contest. The South Carolina public defender attorney was filling in for a colleague at the sentencing hearing for defendant Lamarcus Williamson. It was near the end of the work day — his birthday, no less. At the hearing, Williamson was sentenced to 15 years for robbery, drug and assault. On his way out, he gave Hall something, and it wasn’t a birthday gift. The good news is that Hall was fine, suffering a bloody mouth, and perhaps a thick lip. The judge gave Williamson six more months in jail for the attack. Not like he’ll notice. A Macomb county bar owner’s challenge of the Michigan Clean Indoor Air Act failed because he closed his business and had no intention of reopening it, the Michigan Court of Appeals ruled in the unpublished Department Macomb County Health Dept. v. Boyd Cottrell. Cottrell owned the fantastically named Sporty O’Tooles [sic]. He challenged the county health department’s enforcement of the MCIAA, of which the department caught him violating on more than a few occasions, according to the opinion. But Cottrell closed the bar, losing his standing to fight future enforcement of the act. Here, defendant’s bar was cited multiple times by the Health Department for violating the smoking ban on multiple occasions. Defendant responded by suing to enjoin the smoking ban’s enforcement, arguing that the law was unconstitutional under, inter alia, an equal protection theory. At oral argument, defendant revealed that the bar has gone out of business since this litigation was initiated, and further revealed that defendant has no plans to reopen another bar. The Health Department indicated at oral argument that, because defendant’s bar has closed, it could no longer seek to sanction defendant’s bar for violations of the smoking ban. In short, it is impossible for us to grant the relief requested by defendant. Defendant is now out of business— accordingly, enjoining the ban’s enforcement would not provide him any relief. Moreover, because defendant has no plans to reopen, the continued enforcement of the smoking ban will not continue to affect him in a collateral way. Farewell, Sporty O’Tooles, we hardly knew ye. Behold! Your tax dollars at work! 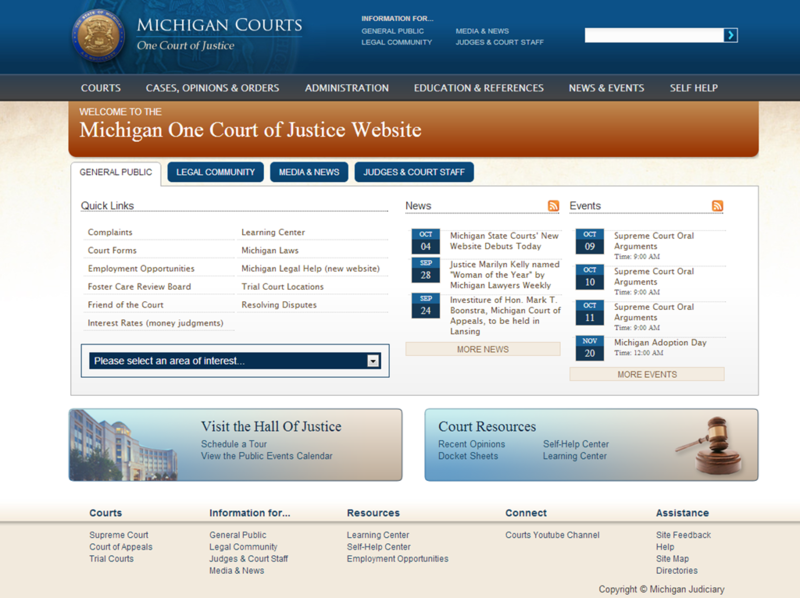 The Michigan judiciary unveiled a new look at its website, www.courts.mi.gov. The new site offers pretty much everything the old one did, but is designed to be better organized, said Michigan Supreme Court Chief Justice Robert Young Jr. in a press release. Young said the site remains an ongoing project aimed at making it more user friendly for lawyers and the public at-large. After clicking about for a few minutes, I’d say the goal of making a better looking and more accessible site has been met, at least when compared to the past site. Searching for appellate case status is still searching for a needle in a haystack in some cases. Perhaps the court could add an advanced search capability that would allows the user to remove, say, all criminal or civil cases from a search. This would improve the ease of searching for certain cases, particularly for instances where the party name is fairly common. With the old site, it was difficult at times to search for a case using a party name or attorney name.